Freshman Dylan Taber won the 126-pound title at Saturday's Belmont/Platteville Invitational to help the Braves finish third at their own tournament. POSTED January 16, 2019 1:07 p.m.
BELMONT — The Belmont/Platteville wrestling team crowned five champions and had a pair of runners-up in a banner performance to place third out of 11 teams at their own Belmont/Platteville Invitational on Saturday. Freshman John Burbach (120 pounds), freshman Dylan Taber (126), senior Christopher Gillen (132), junior Brady Johnston (138) and junior Will Schaefer (195) each won individual titles for the Belmont co-op that racked up 232.5 points. Junior Tristen Gilbertson and sophomore Michael Douglas each went 4–1 and placed second at 113 and 285 pounds respectively. The Braves finished just 13.5 points back of champion Monroe (246) and five points behind runner-up Cuba City/Benton/Southwestern (237.5). Burbach (10–4) won his pool with two pins and a 5–2 decision over teammate Tanner Paulson, then recorded a 17–2 tech fall before winning a 13–2 major decision over Dodgeville’s Drew Palmer in the finals. 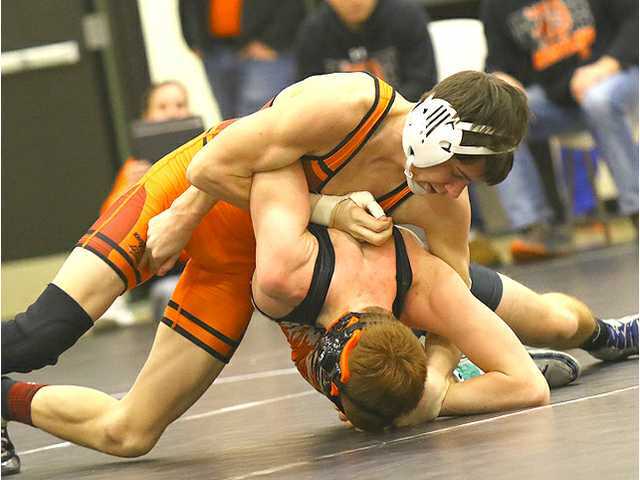 Taber (14–10) pinned all five of his opponents on the day and earned his first tournament title with a 4:16 fall of Dodgeville’s Austin Phelan. Gillen (9–1), who recently returned to the lineup, recorded four pins and a forfeit to win the 132-pound title. He pinned Lake Mills’ Victor Tenev late in the second period of the title bout. Johnston (15–8) pinned Cuba City/Benton/Southwestern’s Coln Blackbourn in the 138-pound championship match. Schaefer (26–3) dominated the 195-pound class with a bye and four pins under a minute. He put Julian Gruber of Monroe on his back 55 seconds into the title match. The Braves (1–4, 0–3 SWC) dropped a Southwest Wisconsin Conference dual at Prairie du Chien (10–1, 4–0) last Thursday night, 47–24. Belmont/Platteville will return to action Thursday night against visiting Dodgeville. The Braves will then compete in the Monroe Invitational on Saturday. Team scores — 1.Monroe 246, 2.Cuba City/Benton/Southwestern 237.5, 3.Belmont/Platteville 232.5, 4.La Crosse Logan/Central 188, 5.Dodgeville 145, 6.Madison Memorial 139.5, 7.Fennimore JV 132, 8.Boscobel 100.5, 9.Reedsburg Area 94.5, 10.Lake Mills 82, 11.Cambria–Friesland/Pardeeville/Randolph/Rio 43. 113 — Tristen Gilbertson (18-8) went 4–1, placed 2nd and scored 27.5 team points. 120 — John Burbach (10-4) went 5–0, placed 1st and scored 32.0 team points. 120 — Tanner Paulson (12-13) went 3–2 and placed 3rd. 126 — Dylan Taber (14-10) went 5–0, placed 1st and scored 35.0 team points. 132 — Christopher Gillen (9-1) went 5–0 ,placed 1st and scored 35.0 team points. 138 — Brady Johnston (15-8) went 5–0, placed 1st and scored 33.5 team points. 145 — Payton Nielsen (4-9) went 1–4, placed 8th and scored 0.5 team points. 152 — Trevor Heim (6-13) went 2–3, placed 6th and scored 10.0 team points. 152 — Caleb Wright (5-7) went 2–3 and placed 7th. 160 — Shannon Gill-Mast (9-15) went 1–4, placed 9th and scored 2.0 team points. 195 — Will Schaefer (26-3) went 5–0, placed 1st and scored 35.0 team points. 285 — Michael Douglas (23-7 went 4–1, placed 2nd and scored 22.0 team points.